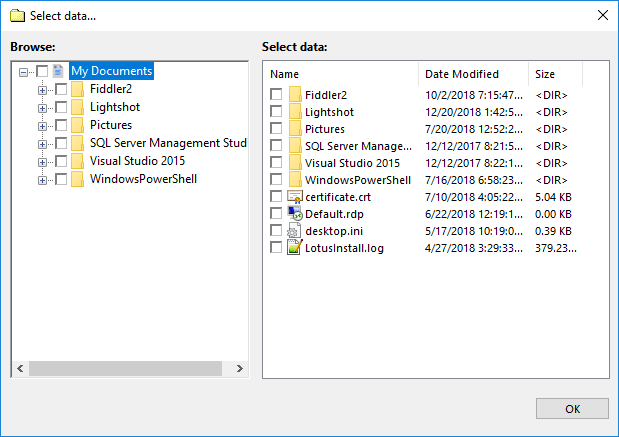 The User Folders group contains plug-ins that allow working with standard Windows folders (Documents, Desktop, Pictures, Videos, Music) located at C:\Users\[Username]. These plug-ins are user-specific, and depend on account under which the Workstation component runs. These plug-ins are "children" of the Computer plug-in, and inherit all of its properties. Particularly, plug-ins can back up files that are exclusively opened by other applications, through the use of the Volume Shadow Copy Service. If you want to back up open files, then you need to have this service running on your system, and Workstation must be launched from a user that can access it. File system: Plug-ins from the User Folders group provide one-to-one mapping to common file system. Files and folders support all attributes, such as file size, modification time, and other. 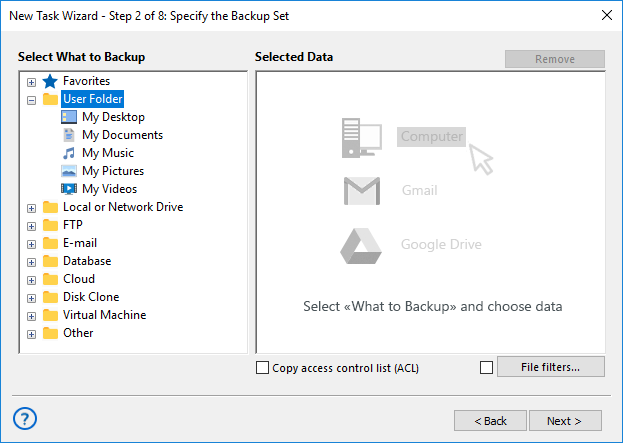 Any of the User Folders plug-ins can be used either as source of data for backup tasks or as a target for restore tasks. In the Data Sources pane, click onto My Documents in the User Folder group. The Select data...dialog will open. When finishing selection, click OK. Selected data appears in the Backup Set pane of the New Task Wizard. For general instructions on selecting data for backup, please see Specify Backup Set. In the Specify Index File dialog, browse for the backup, select an index file (backup.hbi), and then click Next. For example, if your backups are stored in a local file system, then you need to select Computer in the Storage Destinations pane to the left, and then browse for the backup in the Index File Selection pane to the right. Select a file, or a folder for which you want to change restore path, and then click Change Location. 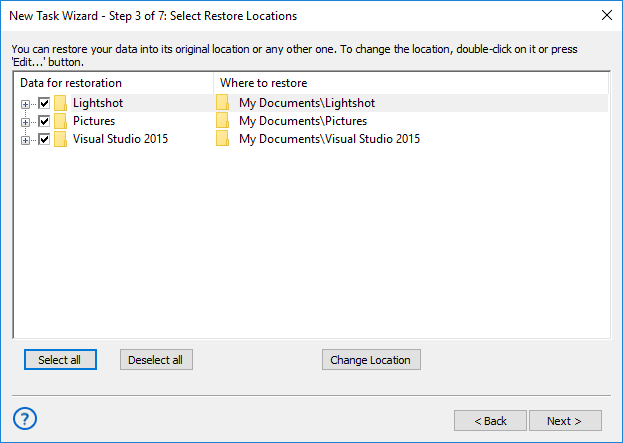 The Change restore location dialog opens. 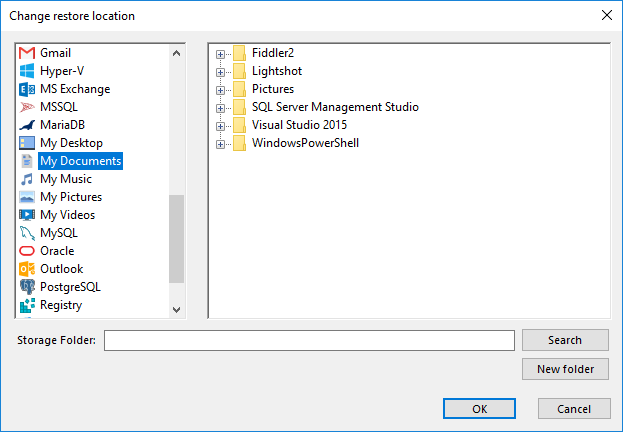 In the Change restore location dialog, select where you want to restore file or folder, and then click OK. Note that in this dialog you can select a different file system than the one provided in the User Folders group, e.g. Computer or FTP. After verifying paths for restoration, you need to select type of restoration, enter password for decryption (if the backup is encrypted), schedule the task, and name it. These steps are not specific to using the User Folders plug-in group. To learn about restoring data, please see Restore Task.